Manon is a part of your world now. 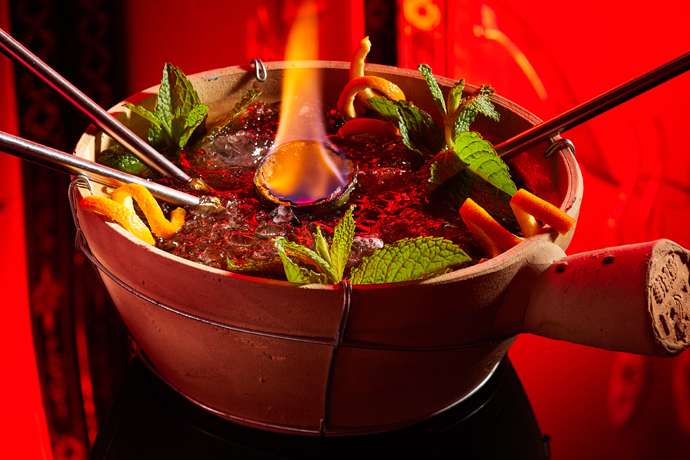 It’s a 5,800-square-foot, trilevel technicolor baroque monster of a lounge and dinner spot in Meatpacking, opening next Wednesday. And now, for your convenience: a user’s manual. Taste the rainbow in the bar/lounge. The neon bar and the fractured-glass wall behind it change colors nightly. That gilded, slate-gray relief ceiling above you does not, but it’s impressive. You’ve got tufted banquette grottos tucked into exposed brick walls. Get one. Order up a vodka cocktail (a former Amor y Amargo and Milk & Honey man dreamed them up) and speculate on which world-renowned DJ’ll show up. That velvet-couch-laden mezzanine overlooking the bar: that’s for you. Bring a companion for each arm. Sit. Watch. Below you: the buzz of the lounge. Above you: oh, look at that, an elaborate crystal chandelier hung from a glass ceiling displaying yet another floor. Find floor three. Eat something. It looks like a rainstorm made of gold. And it’s where plates of lamb loin and chilled foie gras with strawberries and raw hamachi find you. They always do. But don’t worry about the menu. You’re... special. So our friends at UD Perks are hooking you up here with a little something nobody else gets. It’s a lobster roll. With California uni. And osetra caviar. It’s really the subtlety you’ll admire most.